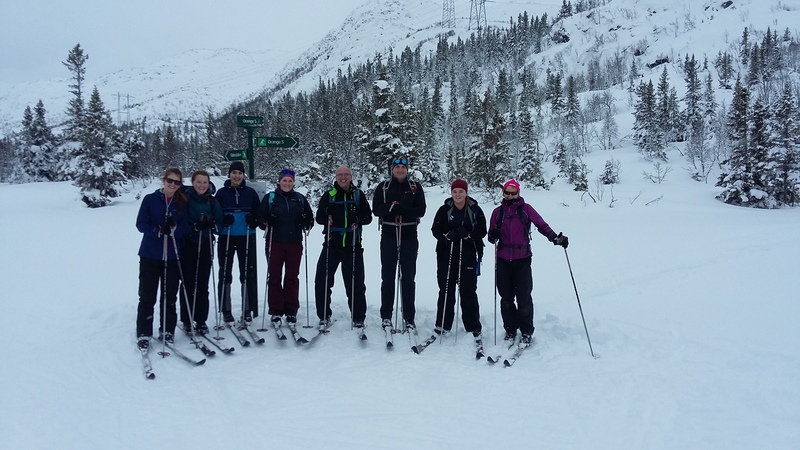 A 6-day journey of discovery and new experiences by a mixed team of eight Senior Cadets and Cadet Adult instructors who were all Nordic skiing novices out on the snow making memories. A long journey from UK to Oslo Airport in Norway followed by 4-hour drive culminated in our arrival on a snowy plateau 1200mts above the town of Rjukan in the early evening. Kvitåvatn Fjellstue was to be our home for the week. The accommodation and food were given a thumbs up however that was nothing by comparison with the impressive view of our surroundings revealed in the early morning light during breakfast. The first day started off by collecting what felt like 80s equipment with, at first glance, what looked like Dr Martin shoes and massive baskets on the poles. This was our Nordic skiing equipment. A central theme of this expedition was being given the responsibility and engaging in the risk management process. This gave us ownership for assessing the risk factors and making the decisions on how we would manage the environmental conditions. First wax lesson done and we soon got to grips with new a new type of skiing for some or a completely new experience for others. We had a fun introduction to the new skills of travelling across country on our Nordic equipment. These skills were put into practice during our first tour across a frozen lake that put some on edge, some on their bums but everyone had a huge smile. The challenges and physical effort of the short tour left happy faces all round and excitement to see what the rest of the week held in store. The day culminated in a review of our achievements and an evening presentation on winter hazards in the mountain environment. Cold winds greeted us on day two. A short indoor practice after breakfast set the scene for the rest of the day’s activities. We were let loose in the outdoor practice arena to warm up and stretch off ready for the morning session on downhill techniques. We headed over to a groomed piste to go through the different techniques to control our speed and direction when tackling downhill slopes. For many of us the downhill techniques were daunting to learn but the session was intermingled with some fun activities to make us relax and as a result of this skills session confidence was sky high. After lunch we embarked on a longer tour of 7km, tackling ever steepening slopes both up and down hill, which gave us a chance to test out our newly developed downhill skills. The landscape was breath taking. The clear skies and sunshine providing us with an impressive view of Gaustatoppen the highest mountain in the local area. Moral was high. Getting back just as the sun was setting prompted us to reflect on a great day. The day was rounded off that evening with our standard review of our accomplishments and a presentation on avalanche awareness. Day three started with thoughts about the challenges ahead knowing there would be new skills to be learnt and a demanding 8km cross country tour. We started off with some adventurous off-piste trail breaking in deep snow weaving our way in and out of trees to practice traversing with a kick turn. The group were briefed for the 8km tour and it was turned over to us to manage the group and navigate the route. This was an exciting opportunity to not only practice ski techniques but to also take on a leadership role. The unknown route gave us the sense of adventure. Getting up those steep hills and on top of the mountains to see some stunning views gave us an enormous sense of achievement. The downhill sections added a real sense of fun about the touring experience. Teamwork was the word of the day. The sense of a self-supporting adventure made people feel exhilarated and the whole group were positively brimming with confidence with what they had accomplished. After the evening meal we again reflected and reviewed what we had achieved. Day four was our first big adventure off-piste. Some people got to grips with the deep snow straight away whilst others were face planting and had to excavate themselves from the waist deep snow. This was definitely a fun day which finished off taking the green route up and around the plateau at a good pace pushing our uphill and track skills. That afternoon, we took a trip to the Vemork Museum to see the history about the heroes of Telemark commando raid. But that wasn’t the end of skiing. After dinner we went out for a short night ski. Making our own tracks with no head torches and star gazing was amazing. The 4-day build-up now led to the climax of the course, an overnight expedition in a Norwegian mountain hut. The group were excited and enthusiastic to take on the challenge. After getting the only chairlift part of the way up to the plateau, we made a slippery start to the journey. We had misjudged the grip wax. Time to apply some real sticky stuff and we were up and away. The first hill was hard and as we got close to the top the winds picked up and suddenly the landscape felt baron and remote. This gave us a sense of real adventure as we did not see another person or any wildlife which made us feel like we were part of an arctic movie. 12km later and the group were at the hut tired but well pleased to be there. There was no time to rest, jobs needed to be done. Melting water, making a fire to warm the hut and cooking to be done. Cooking dinner was the next test, preparing soup and reindeer meatballs with pasta using just candlelight was a first for many. Before the final course of pancakes, the group headed out for an unforgettable night ski under the moonlight and stars, a great end to the day. After a warm restful night and porridge for breakfast, more jobs were to be done to leave the hut nice and clean for the next travelers. Fresh water left, fire cleaned out and the skis were on ready for the ski back. It was sunnier and less windy than the day before but the track was very icy. When we got to the top of the final steep slope it was apparent that the snowplough was the only technique that would work. Legs were burning but once all of us were safely back down there were enormous smiles all around. This expedition was really one of a kind, being able to ski out to a remote location with spectacular views and staying in a mountain hut was an amazing experience. 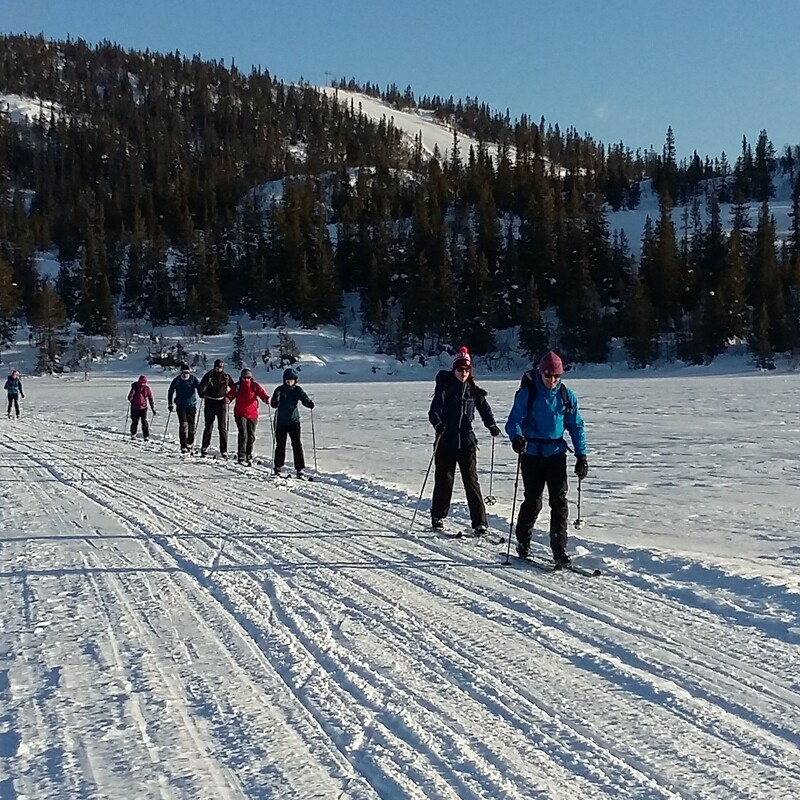 In total each person had skied 55.5kms during the 6-day Nordic foundation course. In a short period we had learnt and developed a range of skills on a new type of skiing platform which is far different from Alpine skiing. It was physically demanding, adventurous but hugely rewarding. We had enormous fun, a bundle of laughs and created some wonderful memories of skiing in Norway. Our sincerest thanks to the Ulysses Trust for their financial support.